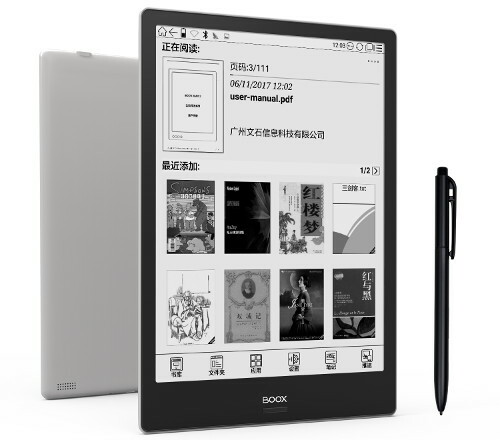 As someone pointed out over at MobileRead, Onyx has released a couple of different versions of the Onyx Boox Note in China, the Note+ and the Note Lite. At this point it’s unclear if Onyx intends to release them internationally alongside their other Note models or not. Sometimes the different versions are only available in certain regions. One of the odd things about Onyx is they often release like 10 different versions of the same model. It’s needlessly confusing to customers and the differences are often minor. For instance, the new “Lite” version of the Onyx Boox Note is exactly the same as the regular Note except it lacks a Wacom touchscreen. It’s funny how they’re releasing a “Note” model without the ability to write notes. It’s not like you’re required to use the stylus with the regular model anyway. But it’s cheaper so I guess that’s worth something. The Note+ adds a flush front screen and it’s about 35 grams heavier than the original Note. It’s unclear how the flush screen is implemented exactly, but it appears that they’ve added a glass layer to the front. The Onyx Boox Note is by far my favorite new ereader released in the past year, and it would be nicer if it had a flush front screen, but not if it’s glass. Writing on glass is not a pleasant experience. The flush front screen on the Sony DPT-CP1 and Remarkable is much nicer without glass, and feels a lot more natural and paper-like when writing. The Note Lite gets released tomorrow, September 1st, and the Note+ was released on August 27th. Interesting. I hope they sell a good versión for other countries. Video of this was leaked on YouTube 2 weeks ago but taken down couple days ago. Nuts to AliExpress. Soon after I tried and failed to place an order for the Likebook Note my credit card information was stolen and that was the only new place I had ordered from. I hope it has the ability to lock unlike previous models that have all security functions turned off. They’ve added a password lock feature with the latest update. I have the Note, but I have not used the stylus, not even once. Got the device as a PDF reader for my technical books library (mostly Humble Bundle and from when O’Reilly had book of the day deals). I really like the device so far, 2 months since I got it, I use it every day. Have also read a couple of books with the Kindle app. So, for those in a similar use case scenario, go for the Note Lite! It is great for PDFs. I’ve been salivating at the Boox Note since I read about it on this blog, but my use case doesn’t involve a stylus and Wacom screen. Been a struggle to shell out $500+ USD for it, though. So for my purposes the Lite may suddenly become a very, very interesting option.